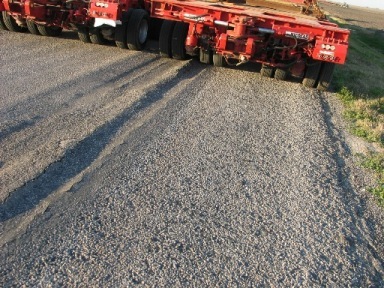 Shearing of the pavement surface during turning movements (see Figure 13-4). The figure emphasizes the need to consider road geometry in the super heavy load route evaluation. 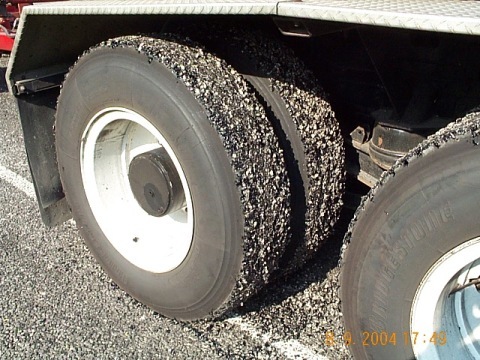 This damage can be prevented by using trailers with steerable axles. If the mover does not have this equipment, the mover must take effective measures to protect the surface at the turn. Rutting or cracking due to overload of the pavement structure. Recent rainfall or poor drainage conditions resulting in weak or wet subgrade or base materials are often associated with structural damage of this type (see Figure 13-5). The figure also shows the need to consider road geometry. 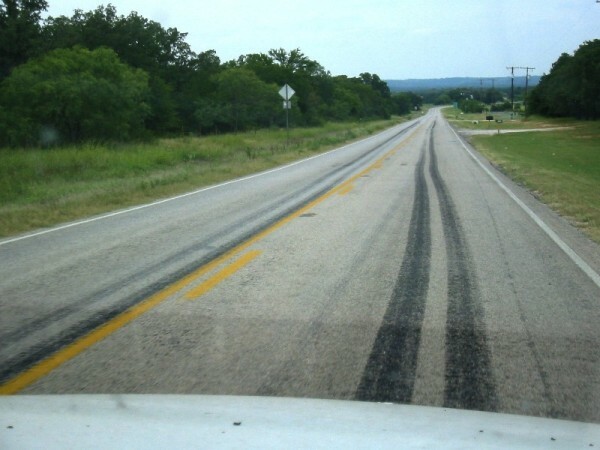 The road is narrow, and the outside tires are tracking on the unsurfaced shoulder. Moving of super heavy loads should be avoided on such roads. If there is no other route available, the carrier must effectively protect the shoulders where the trailer is going to track. Peeling of fresh seal coats or asphalt concrete pavement overlays (see Figure 13-6 and Figure 13-7). Moves should be avoided on fresh seal coats. If there is no other alternative, the mover can take effective measures to protect the pavement. 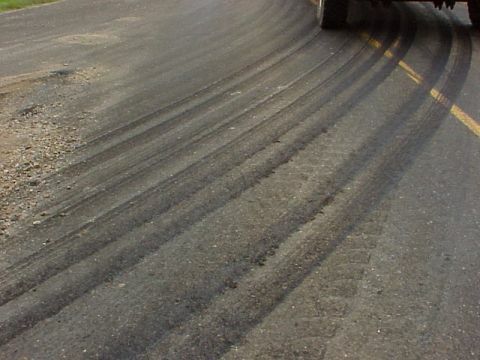 Bleeding of seal coats or asphalt concrete surfaces (see Figure 13-8). 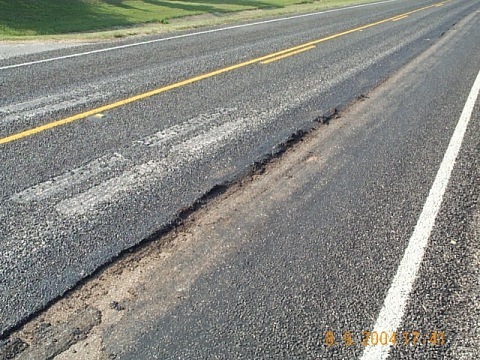 Lateral shear failure at the pavement edge (see Figure 13-9 and Figure 13-10). Figure 13-4. 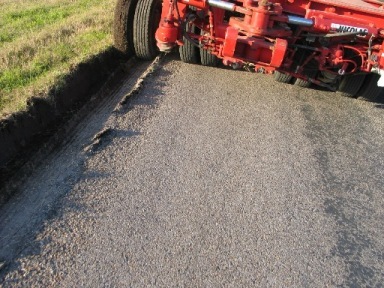 Shearing of the pavement surface during turning movements. Figure 13-5. Rutting or cracking due to overload of the pavement structure. Recent rainfall or poor drainage conditions resulting in weak or wet subgrade or base materials are often associated with structural damage of this type. Figure 13-6. Peeling of fresh seal coats (1st photo). Figure 13-7. Peeling of fresh seal coats (2nd photo). Figure 13-8. Bleeding of seal coats. Figure 13-9. 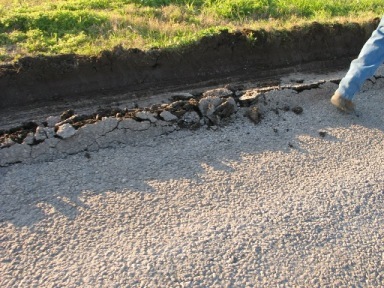 Lateral shear failure at the pavement edge (1st photo). Figure 13-10. Lateral shear failure at the pavement edge (2nd photo).